1. Go to Library Search, the UCI Libraries' discovery tool. 2. Type a keyword or phrase into the search bar. Use the drop-down menu to limit your keyword search to UCI-owned materials. 3. Click the magnifying glass to perform the search. 4. 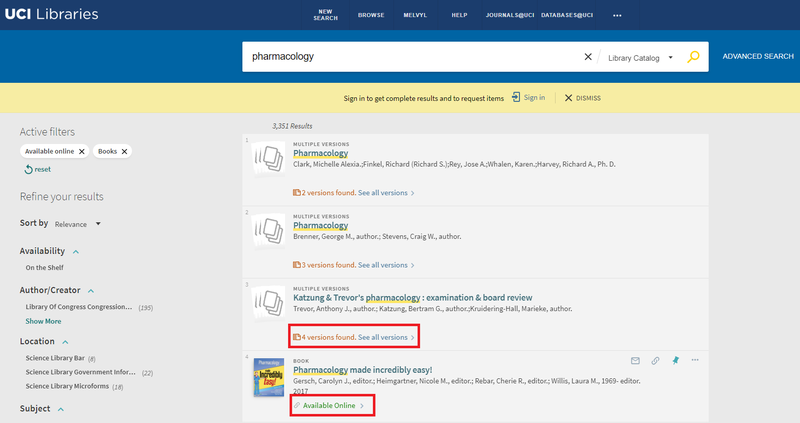 Under "Refine Your Results", click on Books and Available Online from the options down the left hand side of the screen. 5.These refinements will leave you with a list of available eBooks to view online, and you will have the option to click on the Available Online or See all versions link beneath the title of your item. 6. Once the record of your selected item opens, you can then access the eBook by clicking on the link under "Full access online". Search results will include eBooks and eBook-like works, such as government reports, conference proceedings, and the U.S.Congressional hearings.